If you cannot find what you are looking for, why not give one of our trainers a call on 0870 760 7360? The minimum required to work abroad is the BASI Level 2. Level 2 instructors find work all over the world in places such as Switzerland, Austria, Italy, USA, Canada, New Zealand, Australia, Japan and Argentina. To complete the Level 2 please see the BASI Pathway to find out what is involved. What is the difference between the 10 week Part-Time and the 10 week Full-time courses? The courses are identical except the Full-time course involves training on all weekdays (15hrs in total) in the middle 6 weeks of the course as opposed to 2 afternoons a week on the part-time course (6hrs in total). 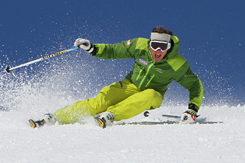 Both courses culminate in the BASI Ski/Snowboard Level 2 Licence. The choice as to which course to do lies with you and is dependent on how you wish to structure your further development in the middle 6 weeks of the course. 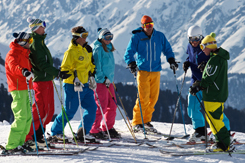 If you are happy to work on your skiing on your own or with friends and to have your progress monitored by the trainers twice a week then go for the Part-Time course. If you would rather do your training sessions in the group environment with the trainers everyday then go for the Full-Time course. If you are unsure, then please feel free to call a trainer for advice on 0870 760 7360. What can I do with a BASI qualification? 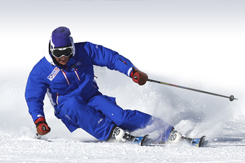 BASI - The British Association of Snowsport Instructors - is the governing body responsible for the training and grading of British Instructors. There are four BASI levels, Level 1 - Level 4. A BASI qualification allows you to teach anywhere in the world, including Europe, New Zealand and the Americas. Whilst you have to be a BASI Level 3 with the Test Technique to work in France, you can work elsewhere with a BASI Level 2, and ICE can help you find employment in Europe or elsewhere with your qualifications which will allow you to teach during university holidays etc. This is where BASI has the edge over the American, Canadian and New Zealand qualifications which are not recognised in Europe. ICE run employment seminars during courses to help you gain employment when you are successful and are always on hand after the course to help you get a job, provide a reference etc. Is there a minimum level to attend the Gap course? We can cater for a large range of abilities since there are many groups on the course. Because of this, if you are already a good skier or rider your level will be pushed with other good skiers and riders around you. Our trainers train and assess to the highest levels in BASI so there is no ceiling to your improvement. Similarly if you are an inexperienced skier or rider you will be in a group with similar abilities so your needs will be met in this respect too. People have attended the course with as little as 1-2 weeks experience and have still achieved the level through hard work and commitment to the programme. An average previous experience across the Gap course of this type is roughly 8-10 weeks. Does the course guarantee me a qualification? 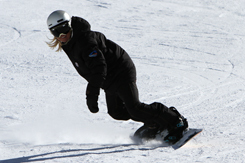 The levels for qualification are set by BASI and upheld by the training staff at ICE. Therefore a qualification to any level cannot be guaranteed but the very best training, preparation and opportunity to achieve it is available with ICE. If you are successful on the Level 2 Instructor course then your job prospects are excellent. Through our knowledge of the industry and extensive contacts, we can help you find employment on a week to week basis (maybe in university holidays) or for the season. We can even place you straight after the course if you want to start work right away. Do ICE organise travel to and from resort? On all residential courses, ICE organise a transfer to and from the airport at a scheduled time at the start and end of the course. This is included as part of the course fee. It is the students’ responsibility to make their way to Geneva Airport, although we can make a booking for you with an airline for a small admin fee. When skiing for an extended period such as this, it is no longer really practical to hire equipment, so we would recommend that you buy your own skis and boots. However you will be able to benefit from discounted prices available through our partner organisation, Killy Sport in Val d’Isère. During the first week of the extended courses, our staff are on hand to provide expert advice in the test centre on which skis to try and our bootfitters can work with your boots over the course of the week if necessary to get the best possible fit and performance from your boots. We can see the prom dresses 2016 model in the second picture. This knee-length peach dress has tiered ruffle details applied on the skirt. There is no hard detail embellished on this semi formal dress. How can I find out more information about BASI, ICE and the courses? I am a bit older, is there an age limit and will I be the oldest by a long way? The Gap course is a large course; the largest of its kind. This means that there is a big range of ages, nationalities and abilities. Because of the numbers, we will always be able to fit you into a group that not only suits you ability but which suits your social surroundings too. There are always some 'older' people on the course to chat with and there is no age limit.